The newly released MPLAB X 4.00 now integrates Atmel's ARM and AVR compilers. No mention in the release notes of programming or debugging tough. One thing is for certain: there is no stopping them; the PICs will soon be here. And I for one welcome our new silicon overlords. I’d like to remind them that as a trusted forum member, I can be helpful in rounding up others to toil in their underground support centres. I used MPLAB recently on a little project that I was asked to do and it has a few nice features, but is a bit of a confusing map to read and follow. On the other hand it's been 10+ years since I last used it for development, and I am sure if teh table was turned I would feel the same way about Studio. No mention in the release notes of programming or debugging tough. If they integrated programming and debugging this could be the death knoll for Studio as MPLAB is MAC and I believe LINUX compatible. Wait and see kiddies.....wait and see. But it's not just about compilers does this mean it has a (better?) debugger and how about a simulator? Most of all is it Windows only or is there a Linux variant? Brian, . But it's not just about compilers does this mean it has a (better?) debugger and how about a simulator? Most of all is it Windows only or is there a Linux variant? At the moment I can't find an all encompassing announcement about this. What I've found so far is scattered among various release notes. It would be a bit strange if it didn't have simulation and debugging. Maybe the release of a new version of the Microchip ICD hardware debugger at the same time is somehow related. If they once again had a $49 rather than $99 entry debugger it would be good. Better yet if it does all of PIC, AVR8, AV32, ARM. It looks as thought the ICD4 does JTAG so that's an entry in ARM based chips. Thinks... wonder if Morten's recent move to USA is in anyway related? this could be the death knoll for Studio as MPLAB is MAC and I believe LINUX compatible. Is MPLAB based on any "standard" framework - VS, Eclipse, ... ? obviously an expected move ! Which is why I thought "what then for the Norwegian engineers who produce Studio? " and from there "wonder why Morten moved to Texas?". Is that where MPLAB is developed by any chance? "wonder why Morten moved to Texas?" Four plans are offered: three PPO plans with in-network and out-of-network coverage and an exclusive provider plan. These plans utilize the Blue Cross Blue Shield of AZ network in AZ. All sites outside of AZ utilize the Cigna network. I wonder what the (1) after Atmel Compiler means. Anyway I still have AS4.18, if I can't do a job with that then I'm not interested. hmmm did I ever mention "it's good to be a pensioner"? So John, when was your 65th? Almost time to add another candle so you will be just 2 behind me. It's just a note about where to install the compilers (it uses the default locations) so that the IDE can find them. No note on where MPLABS puts its compilers on a GNU/Linux system. Time to go hunting for if there where any compilers coming with the MPLABX install and where they went.. In one of the menus in MPLABX there is an entry "Xplained". Choosing it yields a message box "There are no Xplained boards connected". I'll go get the SAM D20 Xplained board right away..
Don't start counting your chickens.... I've installed it but it doesn't work well for me. I cannot create new Makefile projects because it complains that the file already exists no matter what I do. Also when selecting a device, the drop list for the AVR MCU's is empty. When creating a new project there is an option for the AVR (Tiny/Mega/Xmega) family, but the device list is empty. Could be because of no compiler installed in a place where MPLABX can find it. To know where MPLABX has it's PIC compilers I started a PIC PIC compiler isn't installed with MPLABX but installs separately when creating the first project. On my Mint the XC16 compiler ended up in /opt/microchip/xc16. Next, I extracted the AVR Toolchain for Linux into /opt/microchip/avr8-gnu-toolchain-linux_x86_64, trying to follow the advice from the release notes. Still no devices to pick. No matter how much I click the Next button, nothing happens. The above step in the wizard just stays put. Why are you picking "user makefile"? Isn't that going to be something like "external Makefile" in Studio? MPLABX detected my SAM D20 Xplained board. (Screen shot on demand). Can't seem to do anything with it, though..
Cant take screen shots while a menu is pulled down. It seems the menu window "eats" all events and does not pass along those it does not want to handle to it's parent. Everything about AVR support seems to be just half-done, not working or mysterious..
selecting avr8 toolchain says "no toolchian in this directory"
i believe we have to wait at least for MPLabX 4.1 to have avr working there.. I don't even have a "avr8 toolchain" to select.. I disagree. There is nothing intrinsic in Java to make the UI bad, as far as I know. It's up to the coders. As for performance, it depends on what you mean by "by far". I'd expect and accept 5 to 20 % slower. With JIT in place most everything should perform close to native level. Is this a claim re some specific software package/library (e.g. some UI library) etc rather than Java, the abstract machine and the run-time? Now, the UI that Microchip has put on the specific MPLAB stuff isn't the prettiest, at least not on Linux. I'm tempted to switch over to Windows and see what is working there..
Is it installed i the right directory? well what is the "right" directory? after your post, i tried c:\program files (86)\Microchip\avr8... seems it is accepting it there "custom toolchain"
yet again avr list is empty, so no "project" can be created..
and it is D:\MCU\PIC OR D:\MCU\PIC\MPLABX even if i manually select folder it says "base directory does not conatin a toolchain"
And there is no C:, let alone any C:\Program Files, on a Linux system. A PIC compiler was placed in /opt/microchip/xc16 by MPLABX, so I placed the AVR Toolchain in /opt/microchip/avr8-gnu-toolchain-linux_x86_64 which to me seems like the reasonable interpretation of what to do in Linux given the "Windows pattern" given. No dice. UI looked better on Windows, so it seems Microchip does not care enough about the UI on Linux to ship/select reasonable fonts etc. Also, the "phenomenon" of not being able to take screen shots while a menu is pulled down is not present on Windows. Have you actually tried it (or are you "just" quoting from the readme)? If you tried and succeeded, can you give a bit of detail on how you did it? It took about 4 years and 3 versions : studio 5, 6, 7 before that got reasonably OK so does anyone think this transition will be any less painful? definitely not, however at this point it does not even install's. Yeah but that's how AS5 started it was a complete POS that was totally unusable when it first appeared. When AS5 appeared, wasn't EW already hired by Atmel? If so, they certainly had the competence to build avr-gcc inside the company..
And, IIRC, the big thing with AS6 was that it incorporated support for the 32-bit AVRs that up until then had their own AVR Studio32. So, "One to throw away" , one for the 32-bitters, and one to get it right. An old programming maxim: "Prepare to throw one away". New Compilers/Targets are relatively easy to add, but Simulation & Debug are a LOT more work. I'd imagine they start with compilers, then add download/ISP, and eventually bring in Simulation and Debug, as resources allow. By supporting Compilers, ALL existing MPLAB users can do a quick build-compare of any Atmel parts, as part of a selection choice. Maybe somewhere here http://www.microchip.com/forums/... after all it's our turn to annoy the MC people now. And we think this forum is bad! I can't log in the MC site even though I ordered samples a little while ago, my email address is not known but it's the same address I had in February last year when I forgot my password and I have an email confirming the change. It's good to be... hmm I think I said that before. There were weird politics at the time. They took on Eric but he did not get to work on the C compiler (which does seem like madness). Only people inside Atmel know why this was. If they had used his skill AS5 or certainly AS6 could have been really good. 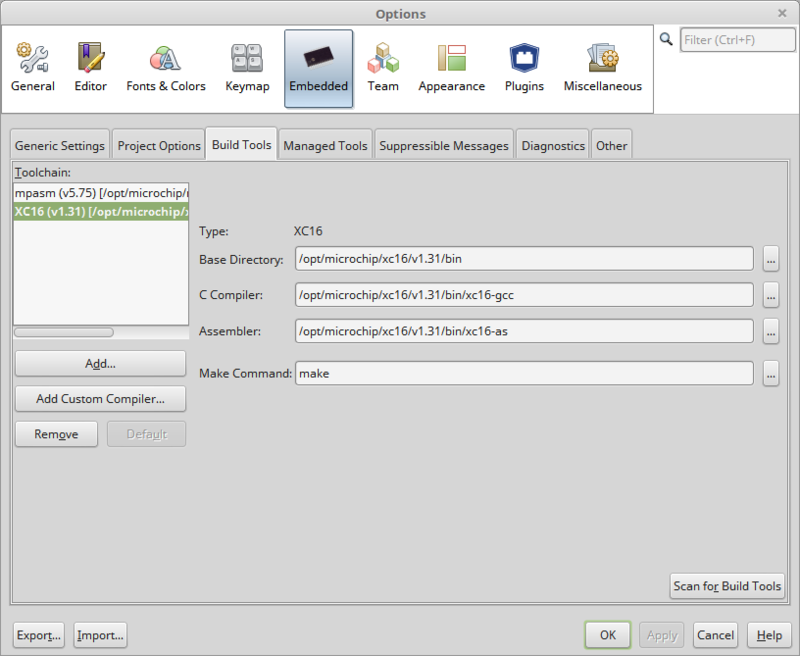 Configuring a general purpose IDE to build a project is fairly straightforward. You simply set up the paths and parameters for the appropriate Tools. Just like you do with a regular Make command. Or if you want to use an alternative AVR Toolchain e.g. IAR or CV. But I would guess that the low level comms between the debugger hardware and the PC might vastly different. Best use of the debugger intelligent commands requires good knowledge of the commercial products. The "look and feel" of the GUI might be the same but debug hardware is different. 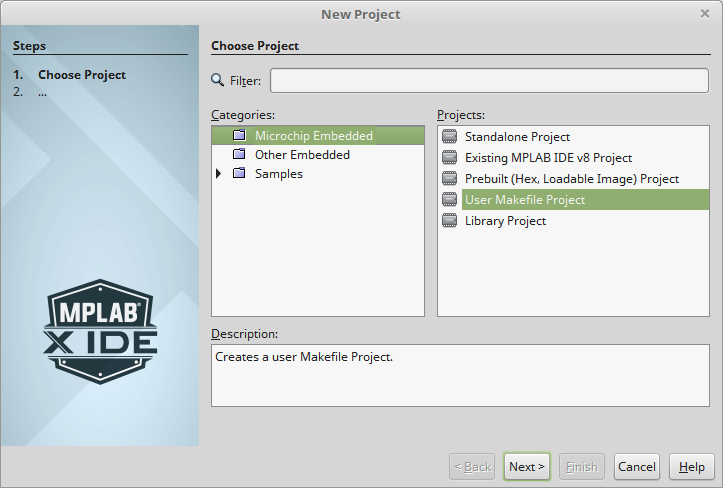 - MPLABX becoming close to Atmel Studio 7 in performance and functionality. The more seriously interesting question is what status this puts Atmel Studio in? So still nothing for the 8051s, then ? You mean this: https://www.eevblog.com/forum/mi... ? And so 23.5 hours later I get approval at the MC forum, of course they are not likely to have top moderators around the world and around the clock. But here registration HAS TO BE instantaneous, can't wait for a moderator to approve the 1st post...and the spammer love it. But that's another story of no value anymore I guess. I need to correct the above. This is a bug in Linux mint (Cinnamon) and its themes, not specifically in MPLABX. THats pretty fast...it took a couple of weeks for me and that was with me asking for a favor from a freak who is a member there to ask an admin to either say yes or no. For the DipTrace community it took a day for the approval and I had to have two posts approved before I was 'cleared' Total about four days. Back after a long week at the Microchip Masters conference here in Phoenix. So, are you guys actually asking a question, or just stirring the brew (... not sure that one translates as well as I hope...)?